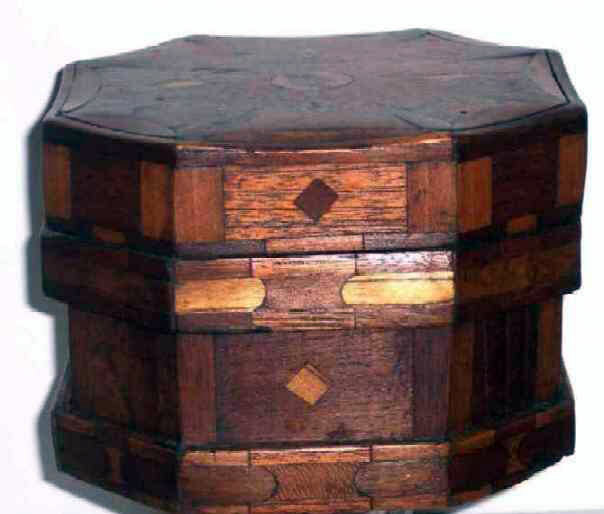 Presented here, a fine octagonal box inlaid and overlaid with various woods. It is roughly 6-3/4" in diameter though the sides of the octagon are flat, and 4-3/4" high with a hinged lid. Superbly crafted, this little box has a lot going for it. The case of the box is walnut and the 295 various sized pieces of mixed woods are fitted together like a puzzle and then overlaid onto the case so we are really looking at a double-walled box. 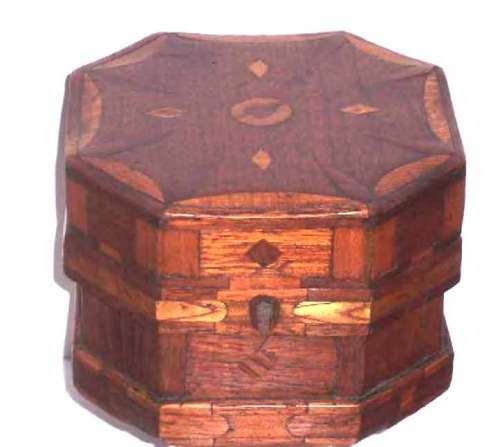 Besides the diamond inlay, the number of pieces fitted together along with the variation in color due to the mixed woods makes this box a visual delight. The grain patterns of the various woods also provide another level of decorative interest. The 16 pieces which make up the edge of top have been cut down to make a dished, scalloped edge. The box is in overall excellent condition and while a couple of pieces of wood have managed to "go missing" long ago, their absence is barely noticeable as they are on the very bottom edge of the box. Since they were laid over the basic case it simply looks as though a darker piece of wood was used there. The interior of the box is very clean and it is of a size that would make a lovely dresser box or simply a box to hold one's treasures. Truly unique and special and certainly one of a kind!